This restaurant is permanently closed. Del Frisco’s Grille is located in the upbeat River Oaks area of Houston. We use local ingredients alongside new classics that are easy to share with friends: Oven-Baked Flatbreads, Cheesesteak Egg Rolls, and Ahi Tacos. The menu also includes a selection of prime steaks, hearty salads, formidable sandwiches and chef-inspired entrees. Whether you looking to host business meeting or a night out with friends, the Executive Room will have all the qualities you seek for the perfect intimate event, while still engaging the welcoming vibe you're looking for. So sad to see this location go! Staff was super friendly and food delicious as always! Good thing this restaurant is closing. Bad food made cheaply, terrible syrupy cocktails, outrageously priced wine. Our absolute favorites are the "cheesesteak" egg rolls! Chicken was undercooked, twice! Hot as hell in the restaurant. Service was mediocre at best. Took a friend for her retirement dinner. Didn’t know they were closing on 9/16/18 for good. Alcohol was half priced which brought in too many loud people to drink. It was hard to have a conversation. I would bet the restaurant was beyond maximum number of occupants. We both had wedge salads and shared the artichoke beignets. Both items were excellent. However, the fried Haddock (which I grew up on in the North) was horrible. Taste was off and there was more breading than fish. Can’t realkt give this a fair review since it’s closing. Good luck to the staff! Thank goodness this place is closing. Come here for a half price bottle of wine only - they are out of most good steaks. Great restaurant and service. Only unpleasant surprise was when I ordered a Heineken beer which was on the menu and a waitress told me that it was out of stock. 5 mn later I ordered it again with a different person and it was somehow available. This place has never disappointed us. 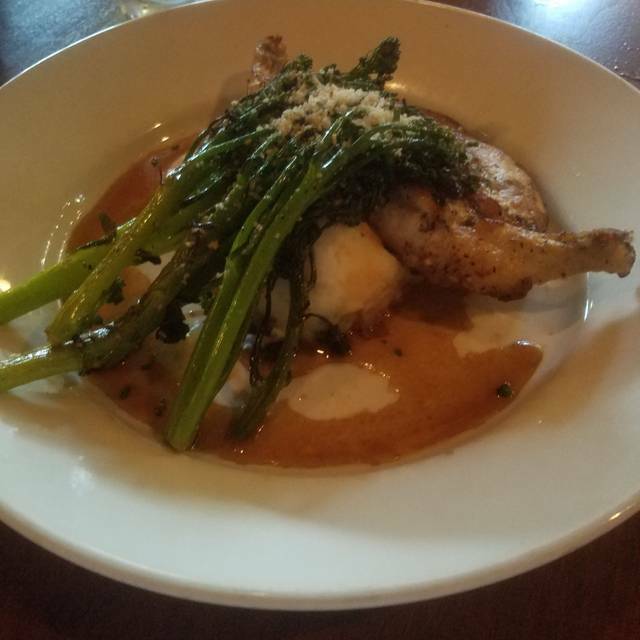 Great food, even during restaurant week! I hope they keep both the short rib and pork shank on the menu! Went here for Hosuton Restaurant Weeks but ended up ordering fromt he regular menu. My friend ordered the Salmon for nearly $30 but the filet was not that large and came served on a platter with a bowl of barely warm mashed potatoes. The presentation and portion was severely lacking for a $28 dish. Also, the salmon filet had a bone in it. I ended up just ordering the the steakhouse eggrolls and they were meh...Overall, I was under impressed and likely will never return. Great food, drinks, and friends! The food tasted great, but our steaks were not cooked right ( we ordered them medium, but they were medium rare). Went to lunch with a friend to celebrate her birthday. We ordered from HRW menu. She had the deviled eggs & shaved steak sandwich, I had the artichoke beignets and the chicken & kale salad. Everything was delicious! I absolutely loved those beignets. We opted to have dessert for her birthday... she had molten chocolate cake & I chose the Nutella bread pudding. Both were good.... chocolate cake was probably the best. 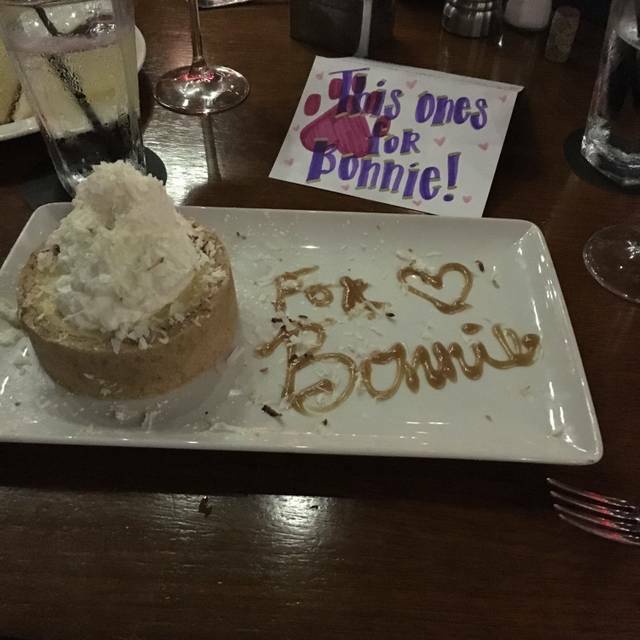 Our server was outstanding and attentive, brought the dessert out with a lit candle & card, nice touch! Valet parking for all the reastaurants & shops in West End. Simply magnificent! From the time I entered I knew I would enjoy my upscale dining experience. Restaurant weeks menu was great & the food was very good. Service was really great. Not the restaurant's fault, but their air conditioning was going out or was out, and it got really warm in there as the evening wore on. That kind of made our experience not great, but we understood. Loved the deviled eggs. Great appetizer for anyone. Seriously! Steak was cooked to pefection. I like the charred edges and warm center. They did fantastic job on them. Dessert was a little rich for me. However, no complaints just bring someone with a dessert tummy. Restaurant week does a lot of justice. The restaurant is pleasant with good staff. It is conveniently local, but I would not recommend it to friends if it was out of their way; not worth making a special trip. My steak was adequate though overcooked to medium rare rather than rare. It was not worth sending back as we were there for conversation and I would have felt sorry for our waitress who was such a nice person. The vegetables were requested "al dente" but arrived overcooked (which is not uncommon in US restaurants). The Cobb salad though was very fresh and crispy, due no doubt to the Chef not getting his hands on it with cooking equipment. Service was awful. Went for brunch with two friends. Waitress seemed bothered because we wanted to dine off the HRW menu. Waitress did not come back to check on us for forever, did not clear our glasses or food plates while we swore still at the table finishing a pitcher of sangria. We had to get up and go find our waitress to ask if she could clear the table and glasses. My red believer waffles were very dry. Devil eggs were good. The business was closed when I arrived. I was disappointed and inconvenienced. We had a group of six to celebrate a special occasion. Most of us ordered from the Houston Restaurant Week menu and had a good meal. The brussel sprout kale salad with chicken had way too much dressing . Next time I would order the dressing on the side. Overall, we enjoyed our brunch. We were at a "get together" with our daughter and her husband since we live in Conroe, TX, and they live in the downtown area. When we lived in Houston, it was one of our favorite restaurants to get with friends. We were doing "Restaurant Week," and for $35.00/person the choices on menu were excellent. My only complaint was the noise level . . . extremely high. Its not a place for quiet evening and/or romantic evening. I had the hostess re-seat us to a more quieter booth since we were right by the open kitchen area, where pots and pans banging, people shouting orders, etc. Great food and great service for reasonable prices . . . who can beat that. We never had a server the entire time we had to flag people down to get service! The hostess was rude and had a bad attitude and didn’t seem as if she was trying to help! My friends and I are all in the restaurant industry at high end restaurant so we’re used to a certain level of service. This was more like chili’s with expensive pricing! It was very disappointing to see other tables with service and we never received anything but a manger that took our order and never came back! We wanted to order a bottle of champagne but by the time we flagged someone down it was too late! Please do better with staffing and get people in that actually want to work! Also the manager lied to us told us no kids menu and no steaks and the table next to us had both! Stop discriminating trust we can afford steak and afford to tip as well!! Great food, service was great. We visited for Houston restaurant weeks. Portions were generous. We will go back. It was a Sunday funday and girls day with my lovely gal pals..
My first time to Del Friscos Grille & it was ok. They left much too he desired. I ordered the Belgian waffles & bacon. 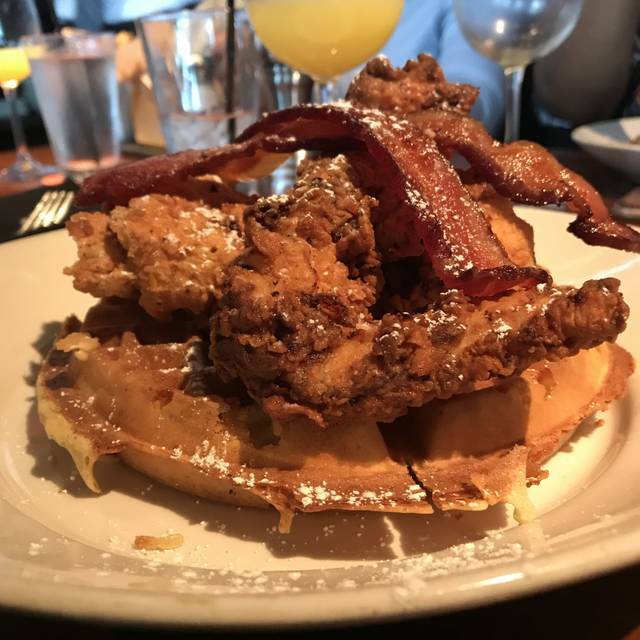 The waffles could have been sweeter & the bacon was cooked to long. I almost hurt my teeth trying to eat the bacon. I would give them a second chance. Unfortunately hair was in my food and in the appetizer of one of my guests. Management did remove the item and offered dessert but it was worrisome that the batch might be totally contaminated. It was difficulty to enjoy the remainder of the meal. So disappointing as I usually love this restaurant and have dined there multiple times in the past 2 months. Not sure I will return. I also was surprised at the dress of some of the employees. Super revealing and inappropriate for a brunch crowd and this caliber of restaurant overall. Service was Excellent! The manager was able to accommodate my friend's dietary restrictions with ease and professionalism. We came to this restaurant with another couple for Houston restaurant week. Overall I really liked this place. The ambiance was nice and I liked how the space had dim lighting. It definitely made it feel more cozy and personal. Noise level was ok; there was noise going on in the place but it actually wasn't bad at all. I was still able to hear everyone at our table without any trouble. To eat I had the deviled eggs for my app course which were really good. I really enjoyed the notes of truffle oil that the eggs had at the end. I had the 6oz filet mignon for my entree. They cooked it just as I ordered it (medium rare) and it came out super juicy. The outside had a nice peppery taste to it which really complemented the meat. And for dessert I had the bread pudding. The bread pudding was ok. I'd give it a 3.5 out of 5. It was good but not the best that I'd ever have had. I would definitely order it with more sauce next time. So overall again it was a good experience and I would def come here again. I have never had a dish here that I didn't enjoy. We have been here for lunch and dinner, everything was wonderful. 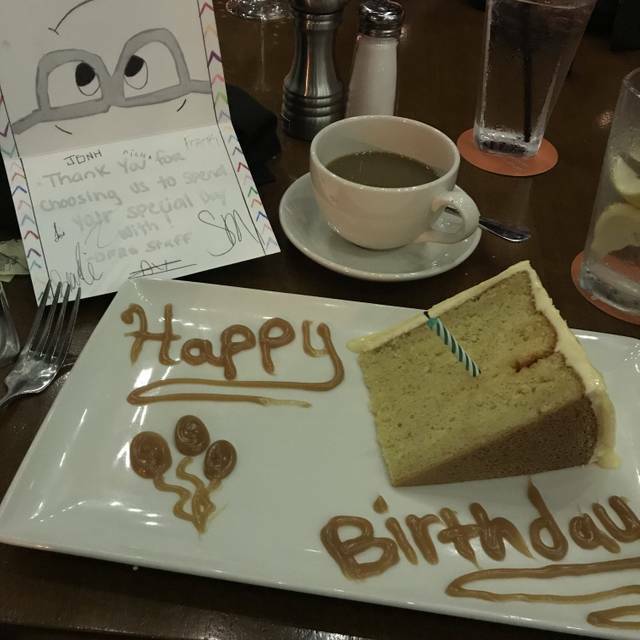 We really enjoyed the service provided and the food was excellent! We will come again! The food and wine were good. Our service was adequate but not very attentive or friendly. The French dip sandwich was dreadful. Chewy and full of gristle. Very disappointing. Went for Houston Restaurant Week lunch. Happy to have a portion go to Houston Food Bank but our meal itself was disappointing. Service was polite but slow even though restaurant was not full. Wedge salad was bland and could have used more dressing. Shaved steak sandwich was fatty and bun was greasy but au jus was good. Fries were unexceptional. Salmon and broccolini were good but not great. Only item I would order if I ever went back was artichoke beignets, although they were more of a fritter. 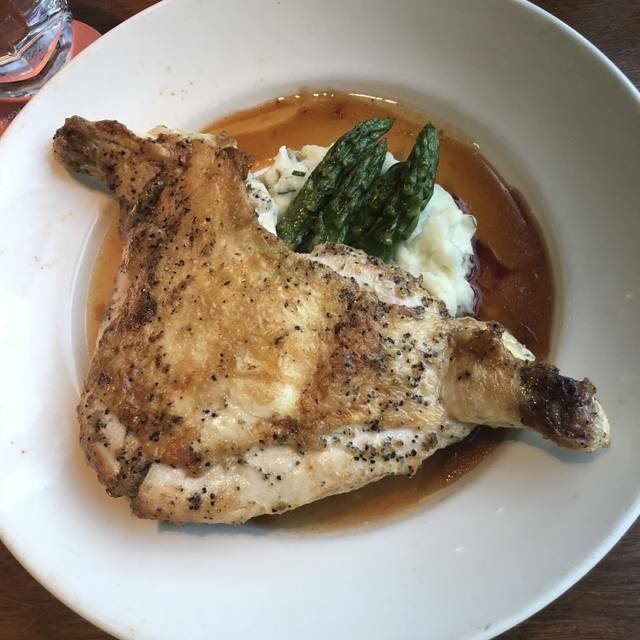 I will start with what I enjoyed about Del Frisco's Grille- Nothing! The dysfunction and lack of preparation for Houston Resturaunt Week was obvious and made for an awful dining experience. First, there was a30 minute wait, despite making a reservation hours in advance. I brought this to the attention of the front of house support who consoled me with complimentary Mimosas. A nice courtesy, but I will note that they arrived in wine goblets, rather than customary champagne flutes- is this not an upscale restaurant? The manager once again expressed her apologies- citing an overwhelming rush as the cause for my frustration. The wait, from arrival to table, was approximately 42 minutes. We were then seated, and serviced by Zach. Our server was a delight.However, it was difficult for him to manage through the dysfunction of the facility. After our waters were given and drinks served, our attention, minds and stomachs were set on our meals. To my dismay, waiting on the food was even more agonizing than waiting for a table. It was well over 1 hour before he arrived with 3 chicken and waffle dishes, a burger and an oder of red velvet Belgium Waffle. The presentation was delightful. However, the food was overdone and bland. The waffles were neither light, nor fluffy... rather a poor tasting toast like substance. The chicken lacked flavor. and the red velvet tasted nothing like you'd expect. Zach was nice enough to take care of the Chicken and Waffles after a complaint was voiced, and stopped once more after we had finished eating to voice his apologies. A courtesy to which my party and myself appreciated. However, in the future the staff should consider better preparation for such a large scale event. It was obvious that they did not account for their new found popularity following the opening of Houston Restaurant Week and this has cost them dearly. We went for restaurant week and three of the four of us had the restaurant week specials. I thought that the values were good for that. The fourth one had a steak and some sides as well as an appetizer. Overall, I would have given the food four out of five stars. One of our steaks which was initially ordered medium needed to be seared longer due to the thickness which was fine. The eggroll appetizers were excellent as were the beignets. The chicken wings were just average at best. The Nutella bread pudding dessert left a lot to be desired. The molten cake was good and what we expected. Our primary complaint was the delay in getting our desserts as multiple tables who were seated after us and ordered after us (ordered dessert at beginning because it was a restaurant week special) got there desserts well before we did. It was so late that our server had to paradise was two different times. And the second time, I point out that others had received their desserts already even though that ordered after us and she told us that the manager would come See us. The manager did come to see us with the desserts. He was apologetic. I would’ve expected potentially a discount on some item, but when none was forthcoming. I understand that it is part of the HRW package. Still, it was so late that I had to change my overall rating to three versus a four. We would dine here again. We understand that stuff happens. From a customer service point of view, there should have been something off the bill. This was our first visit to Del Frisco Grille. It is restaurant month in our city and we decided to try this new restaurant. There is a fixed menu with limited choices for a fixed price of $35. We both opted for the Wedge Salad, which was tasty, fresh, and small, a 6 oz. filet mignon, and chocolate molten cake. The meal was well-prepared and very tasty. The restaurant manager came by our table to ask if everything was to our liking. I felt like this was a nice touch. Leroy was our waiter and the service was outstanding. We were very pleased with Del Frisco Grille and I'm certain that we will return.